Under the Big Oak Tree: 100 Day Weight Loss Challenge Begins Today! Wish me luck! 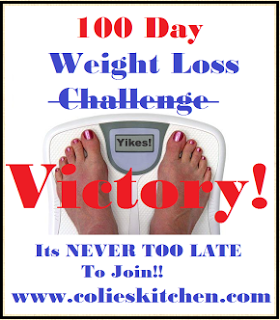 100 Day Weight Loss Challenge Begins Today! Wish me luck! Is it really Monday already? It must be, since it definitely feels like a Monday. I'm just surprised that it's already here. After a very busy weekend full of lots of errands and full of a wide range of emotions, I am worn out and also feel like I may be getting a cold. Or maybe it's just allergies. Grace has been having sleep issues lately, too. Which means Mommy has sleep issues. This kid has been waking up several times a night and I just cannot figure out how to solve this problem. To say I am not prepared for Day 1 is an understatement. Between being both physically and emotionally exhausted and also feeling sick, I'm just not ready. Not to mention the fact that we didn't grocery shop this weekend and the healthy options just aren't in abundance at the moment. All that said, if I don't begin this today, then when? From past experience, I know I am guilty of pushing things off until the following Monday over and over again. Until weeks, months, even years pass without me doing anything to help myself out of this fat situation. Today, as Day 1 of the challenge, I am supposed to weigh in. Sigh. This is going to be dreadful. I just know it. I fully know that I am at my highest weight I've been in my life and the thought of seeing that number today just scares me! To know that I let myself get this heavy and risking my health is very upsetting. I'm also supposed to share what my goals are for this week and the challenge overall. For me, that's the easy part. Much easier than that moment of truth when I finally step on the scale. Easy because my goals have been the same for each and every new diet or weight loss challenge I begin. Overall, I want to lose weight, cut back (way back) on my diet soda consumption drinking more water as a result, kick my sugar addiction and lead a healthier lifestyle. I want to be able to still eat the foods I love, just not as much of them. I need to teach myself portion control. For example, I want to allow myself to eat a brownie and not inhale the entire pan of brownies in one day. Boredom and sugar addiction combined with a total lack of self control all contribute to that problem and it's something I want to work on through these next 100 days. I want to be able to move more comfortably. I'm too young for all of these aches, pains and creaky bones! Not to mention being out of breath from one flight of stairs! I want to feel good about myself. While I know that appearance isn't everything, feeling confident about how I look in an outfit would help me enjoy myself more when we're out and about. I spend so much time fidgeting and adjusting my ill-fitting clothes while we're out that I forget to have fun. My ultimate challenge goal is to fit into my wedding rings by the end of these 100 days. It's been about 5 years since I've worn them. I refuse to get them re-sized and a new ring just isn't in the budget. I think that about covers it. I'm reluctant to choose a goal weight. I'm a perfectionist and if I see that I'm not reaching my assigned goal, I'll end up quitting the challenge. So, instead I need to focus on the other goals and not a set number. As long as the weight is coming off, I'll be happy. 5 lbs, 10 lbs, 20 lbs. lost will all be a step in the right direction! It's 10:30 and I haven't eaten breakfast yet since I've been trying to work up the courage to step on the scale. Monday morning before breakfast will be my weigh-in day. After breakfast, I'll be planning out my game-plan for the week. This will include a shopping list of healthy options as well as a meal plan for the week. Having a list of healthy meal options posted to the fridge will help me stay on track when I'm feeling hungry. In addition to posting here each week, I will also be tracking my success over at MyFitnessPal which is a free online program where you can track your daily calories, log in your weight each week, enter recipes to find calorie count per serving, etc. My profile name there is Fitmomma613 if you want to follow along over there, too! Good luck to my fellow challengers and many thanks to Nicole for setting this up! It's definitely the kick in the pants that I needed! Well, that and the fitting room disaster I had to deal with on Saturday! I won't go into detail as I'm sure you can all relate in some way! I am umJARiley at my fitnesspal and congrats on getting started today even though you didn't feel like it. I know about that. I'm sick too with stupid allergies that won't quit and I really didn't want to do much today but the kids needed me, my grandma needed me and my daddy just called and off I go over there before heading back to the bus so as long as I'm doing it I got my 3.75 mile walk in and another tonight. So I know that you can do this too. It's hard with kids at home (I have a daycare in the summer so I sure do know...well really the past 13 years but now just summer times) but it's doable and your goals are awesome so good luck. Here's to a great and blessed day 1! I know its hard!!!! BUT, with dedication and encouragement you can do this!! Its hard with kids at home!! Sleep is so important, and thats hard!! Hopefully we can do this together!!! Oh Alison you are certainly our shining star for the week. Although most people don't know it you know I do. You are doing so great with this challenge. I know not everyday will be perfect or sunshine but you are going to make it through this time. Again I am very proud of you! Don’t Forget! The 100 day challenge week 1 Friday Round up will post at 5am cst. at www.colieskitchen.com I hope to see your Friday link up!